Earlier this year, U.S. Senators Deb Fischer (R-Neb.) and Jay Rockefeller (D-W.Va.) introduced the E-Label Act, which would allow for companies to meet the FCC's demands for certification labels by placing digital stamps on a device's software as opposed to etching information on hardware. The senators argued that the changes would allow manufacturers to save money and pass savings onto consumers. This was followed by the Federal Communications Commission (FCC) loosening its rules for labeling, stating that manufacturers could bypass etching FCC labels on their devices in favor of labeling by alternative means. Now, The Hill reports that U.S. President Barack Obama has officially signed the E-Label act into law, which will now allow for companies like Apple to drop FCC labeling from their devices. Instead of being etched on hardware, it is likely that the required information will now be inside of a settings menu. However, it is also likely that the certification labels representing the European Commission (EC) and its Waste of Electrical and Electronic Equipment (WEEE) initiative will still be seen on devices. 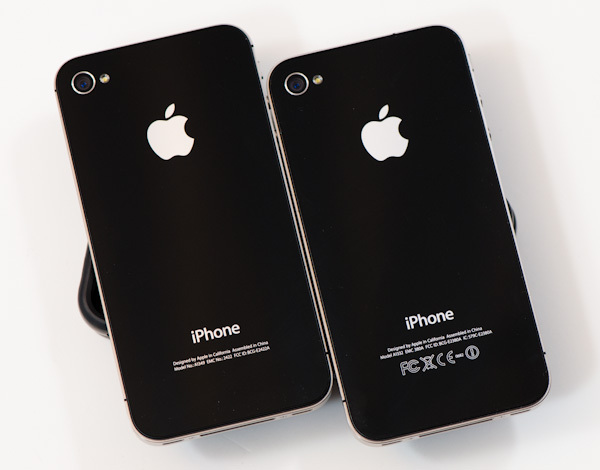 Verizon iPhone 4 without FCC logos on left, GSM iPhone 4 with FCC logos on right. The slight design change could come to Apple's lineup of devices for next year, although it remains unclear as to how exactly the company will take advantage of the new rules and regulations. The senators argued that the changes would allow manufacturers to save money and pass savings onto consumers. Words can not describe how pointless this law is. I needed that good laugh after my long snowy Thanksgiving today. What we have here is a scathing indictment of the American education system. The article says that they'll still have to put all the other logos on so no money will be saved. If you are laser engraving, you aren't paying by the logo or letter. I highly doubt that companies will save a significant amount of money from no longer being required to etch the FCC logo on their products. Further, any savings will not be passed onto consumers. The only upside here is the fact that we'll be getting a slightly less ugly housings on our electronics. Then again, these etchings are always in unobtrusive areas so who cares? Just in time to ensure the aesthetics of the apple watch aren't sullied by these symbols. Why don't you do a little research on how a lot of this crap gets passed. You blame it all on one man when in fact we have an entire country filled with Democrats and Republicans with personal agendas closely aligned with big business. You should change your username to ImSoMad. Your ignorance is closely aligned with @ImSoSad above. You're probably one of those guys pushing for Romney to run in 2016. He lost so get over it. You should change your username to Mittfan. What gets me is that when the country votes republicans to run the house and senate "America has spoken" but when a democratic president is elected, "We have a king". Some days, there's way more humour on the MR forum than on Comedy Central.